(Phys.org) —A barefoot encounter with a Razor Clam is not a pleasant experience, just ask anyone who has had their feet sliced open in the shallows of picturesque Lake Macquarie, north of Sydney. 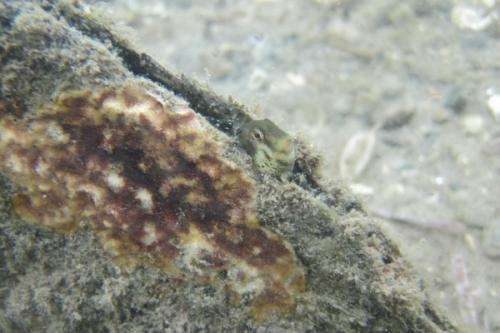 Perfectly camouflaged, the fan-shaped clams, that can grow up to half a metre long, bury themselves in seagrass sediments, leaving just a thin sharp lip protruding. Anecdotal reports of a Razor Clam population boom about 10 years ago have locals worried about how safe it is to swim and boat in the lake and, although native, these bivalves are now considered a pest to be eradicated. Lake Macquarie City Council (LMCC) needs better scientific data to develop a reasonable management strategy and is working with University of Technology, Sydney (UTS) marine ecologist Dr Peter Macreadie to investigate the potential environmental consequences of getting rid of the clams. "We don't know what the ecological implications would be of removing these clams from their environment. At the extreme we could end up with some sort of 'ecological meltdown' or maybe nothing will change and life will go on as usual," says Dr Macreadie, a core member of UTS Plant Functional Biology and Climate Change Cluster (C3). "It kind of brings up the broader question about whether it matters to remove a species. We can all think of organisms we simply wish didn't exist. Personally, I hate flies and mosquitoes. But it's really difficult to know whether they actually have some indirect benefit to humanity. Everything is connected." Dr Macreadie will investigate what impact Razor Clams – also known as Razor Fish - have on habitat and biodiversity by conducting experiments designed to measure clam growth rates, distribution and the number of species relying on the clams for the ecosystem services they provide, such as shelter and food. Removal programs had been done in the past, says Council's Ecosystem Enhancement Coordinator, Symon Walpole, but the results of this research would provide a better understanding of what was now happening with the clam population. "Council doesn't want to do any removal. We would prefer to leave the natural ecology alone but we have to manage risk especially in places like enclosed swimming areas," says Mr Walpole. However, it's a connection to the past that Dr Macreadie believes may reveal the real value of leaving the clams alone. "Because Razor Clams are fast growing, stationary and can live up to 18 years, they may act as time machines to the past and so could be used as pollution bio-indicators. Their shells have growth rings, much like trees, which we can analyse to answer questions about the quality of the water and sediments they have been exposed too." That could be a plus for the local council. "The health and water quality of Lake Macquarie has been an issue and the Council spends a lot of effort and money on water quality monitoring," says Mr Walpole. "We are keen to use improved methodologies, like bio-indicators, that would give us more detailed information to help us better manage our resources."